We'd just gotten our superb new photos back from Fracture, frameless, printed on glass, but were having a heck of a time getting them hung just right. The real problem was lack of minute adjustment: left-right, up-down. 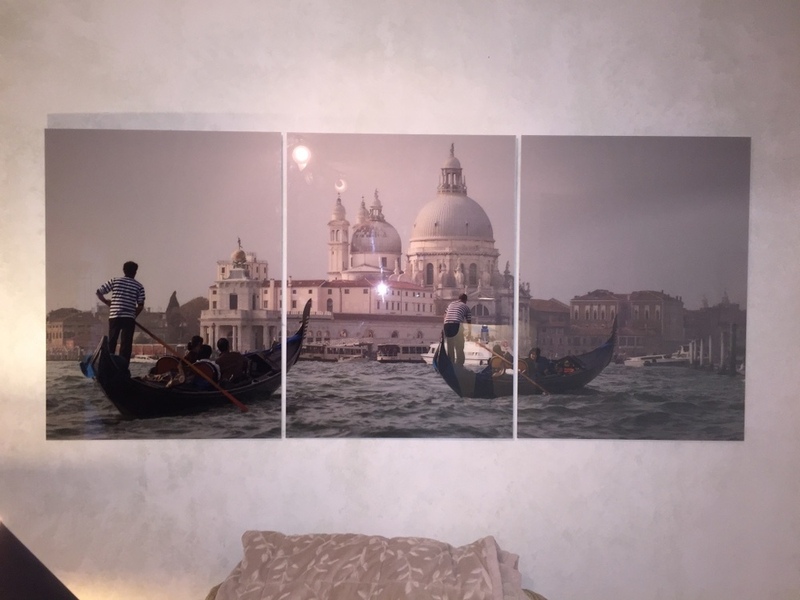 Spacing and alignment are critical in hanging a triptych. After a frustrating week of drilling and filling and fidgeting--getting almost right but not quite right--I hit on "a" solution. Let me know what you think of my idea. Venice and the Cathedral of St. Mary's in the background. After several attempts the laser level hole was well marked, so at least our efforts were "repeatable." This is a self-levelling unit from Stanley. Glass on the front, foam with a black paper backing on this side. The Triangular metal hanger and hole are uniform on all three. That was a big help. 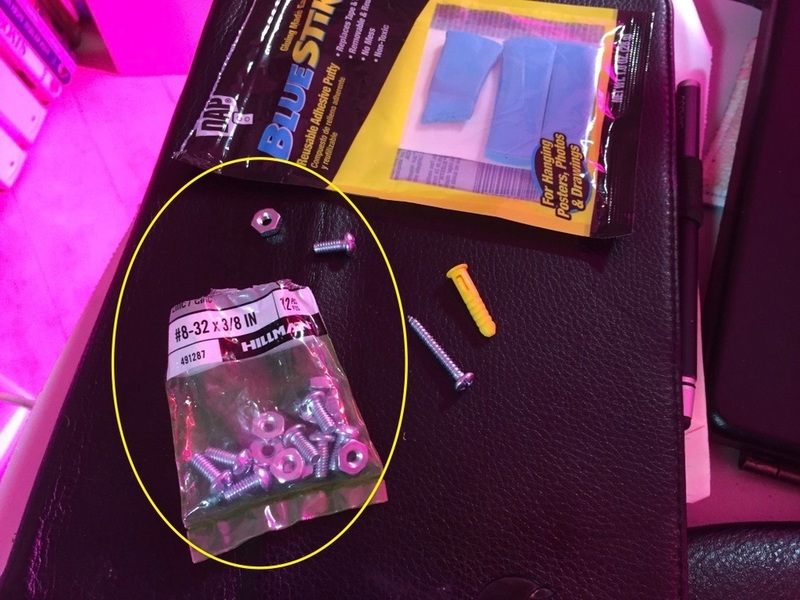 The screw and nut replace the long hanging screw that came with picture. The head of the #8 screw goes in the metal slot. The idea here is to mount this sawtooth hanger on the WALL with the teeth pointed up. You won't find these big sawtoothed hangers at the Blue or Orange stores, not this big. These came in a 3-pack from Michael's framing. You'll have to drill them out for the #8 screw and plastic wall anchors. These pictures are lightweight, but if this system is to work, you must not omit the wall anchors (unless you're catching wood with the screw). If the wall anchors are used, the metal on the sawtooth hanger is lightweight enough you can bend it up and down a bit to adjust for height. If you don't use the wall anchors, you'll just rip the screws out of the drywall. Any longer and the pictures stand too far off of the wall. The round head goes in triangular metal hanger on the back of the picture. Put a dot of this on the bottom back of each picture to hold the final position. Then press the glass front against the wall. Glue the nut at the end of the bolt, just in case. You don't want to take the chance one of these nuts works loose and a panel comes crashing down. Using the Laser Level and (in our case) previous holes as our guide. 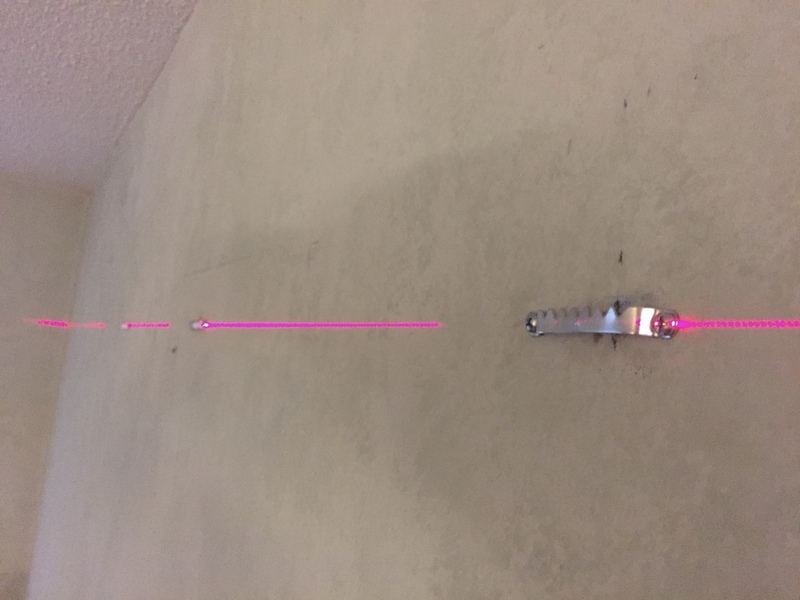 Work from the far end away from your laser level back toward it, to keep the tip of the anchors from casting shadows. Warning: Do Not Look At Laser With Remaining Eye! Seriously, working in a darkened room means your iris is "blown" and your retina is more susceptible to damage from the Laser. All lined up over the previous holes. You can see now for the first time how you can get minute adjustment left and right to get the spacing just right. in 1/8 inch increments. This is much more precise than trying to get 1/8 inch increments using a 1/4 sheetrock screw. The Hanger is lightweight metal. You can bend it up and down a bit adjust for height IF you installed with wall anchors. Otherwise, you'll just rip the screws out. Make sure it's extending out as far as possible. Hang the Left and Right panels, adjusting them slightly left and right to get the correct spacing. (Not shown, but plastic spacers used to lay floor tile is helpful between the pictures).